From late 1942 onwards, increasing numbers of young Jews escaped from ghettos and formed partisan groups which fought the Nazis. 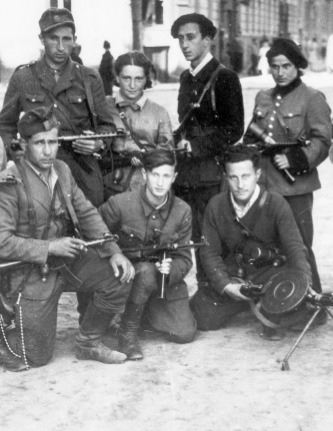 The largest groups of Jewish partisans were based in the forests of eastern Poland, Lithuania and Belarus. The following song became the anthem of these partisan groups. It was written in Yiddish by Hirsh Glik, a young poet in the Vilna Ghetto, after he heard news of the Warsaw Ghetto Uprising. Our step beats out the message – we are here! There our courage and our spirit have rebirth. And yesterday with our foe will fade away. With guns in hand they heeded to the call. Hirsh Glik was murdered in Estonia in 1944. Some of the partisan groups who sang his anthem not only fought the Germans but also sheltered hundreds of Jews, including children and old people, who had escaped from ghettos.